RUSTICAE Experience: "Discovering the Pyrenees: Relax and Disconnect". We will visit the Pyrenees most beautiful places accompanied at all times by leading experts and guides: Ordesa y Monte Perdido National Park, Valles Occidentales Natural Park, Los Mallos de Riglos, Isabena Valley, Sierra y Cañones de Guara Natural Park and Posets-Maladeta Natural Park. Places so beautiful and different from one another, that each day will be unique and special. We will discover villages and their people as well as emblematic monuments, some of which are UNESCO world heritage sites like the Romanesque hermitages of Boí Taüll. Also, the Jaca Citadel, the Roda de Isabena Cathedral, San Juan de la Peña’s Monastery, the collegiate church of Alquézar, essential places to understand the culture and traditions of this mountain range. We will have the opportunity to enjoy the best restaurants of the Aragonese Pyrenees, while tasting great local wines. Rusticae hotels Acebo de Casa Muria and Hotel Barosse, two jewels in the midst of these breathtaking mountains, will be your dedicated hosts in this complete sensory Experience surrounded by captivating wild nature. Pick-up at Barcelona Airport. Lodging and Welcome reception in the terrace garden at Rusticae Hotel Acebo Casa Muria + Dinner and accommodation. Posets-Maladeta Natural Park: Visit Forau de Aigualluts and Aneto peak views + Lunch: Llanos del Hospital Restaurant + In the afternoon we visit Benasque + Dinner and accommodation: Acebo Casa Muria. Sierra y Cañones de Guara Natural Park: Villa de Alquezar. Route to pasarelas del Vero, visit to Alquézar Colegiata. + Lunch: Casa Pardina Restaurant + We discover Enate Winery + Dinner and accommodation: Acebo Casa Muria. Visit Monastery of Santa María de Obarra and Roda de Isábena Cathedral. Lunch in Cathedral Restaurant. 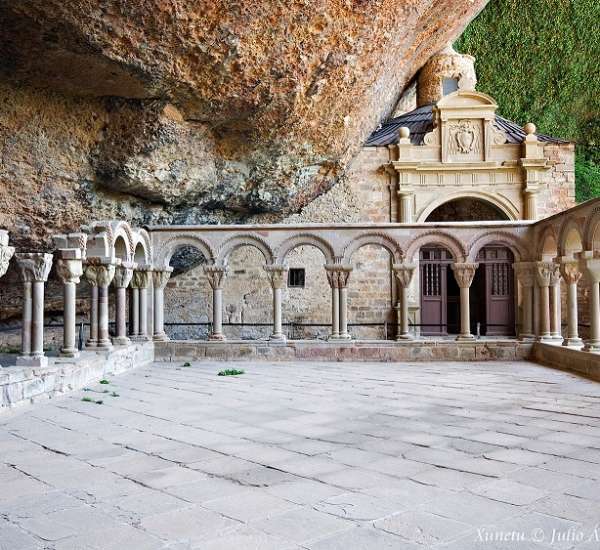 Visit the Romanesque Churches of the Vall de Boí. Dinner in Casa Chongastán Restaurant + Accomodation in Acebo de Casa Muria. Ordesa y Monte Perdido National Park: We will enjoy the beauty of one of the best National Parks in Spain + Lunch: Picnic + Dinner and accommodation: Hotel Barosse. La Jacetania, Valles Occidentales Natural Park: We visit Aguas Tuertas Valley + Lunch: Borda Bisaltico Restaurant + In the afternoon we meet Jaca Citatel + Dinner and accommodation: Hotel Barosse. La Jacetania, Valles Occidentales Natural Park: visiting Aguas Tuertas Valley + Lunch: Borda Bisaltico Restaurant + In the afternoon we go to Jaca Citatel + Dinner and accommodation: Hotel Barosse. Expert leadership and local guides during the entire journey/experience. Accommodation in “El Acebo de Casa Muria” and “Hotel Barosse” as noted in the itinerary. Meals: As noted in the itinerary, in restaurants, hotels or picnic form. Drinks: “Discover the Spanish Wine”: A different bottle of wine with each meal: Rioja, Ribera, Somontano y Penedés. Water, juice, sodas, soft drinks, beer are included. (Alcoholic beverages such as liqueur shots and mixed alcoholic drinks are not included). Shuttle transfers from Barcelona airport and city centre on Day 1 and Day 8 as noted in the itinerary. Sightseeing and adventure activities as noted in the itinerary. Ground transfers during the programme. Admission cost to monuments, castles and chapels during the trip as noted in the itinerary. Rusticae reserves the right to substitute some activities for others of similar characteristics due to weather conditions. Please take into account that a group of minimum 4 persons is needed, in order for the Experience to take place. This Experience is "Only Adults"
"Discovering Pyrinees" is an experience designed by Rusticae with its hoteliers, the best local guides.